Congratulations to the new Duke and Duchess of Cambridge! The marriage of William and Catherine actually lived up the media hype and transported an estimated 2 billion people to a place where fairy tales, at least for that day, do come true. Quite an admirable achievement, if you ask me. Rather than deride our newfound fascination with the couple (who, let's face it, weren't all that interesting during their engagement), I think we should embrace it. Despite my husband's best efforts, I don't see it as a fluffy, escapist exercise. On the contrary. I believe my interest in William and Catherine (and that of millions of other 'royal watchers') is born out of a feverent belief that we -- humanity, not just Americans -- haven't gone to hell in a handbasket despite all the evidence to the contrary. At a time when too many Americans have been lobotomized by bread and circuses (what other excuse is there for a Donald Trump faux presidential campaign?) 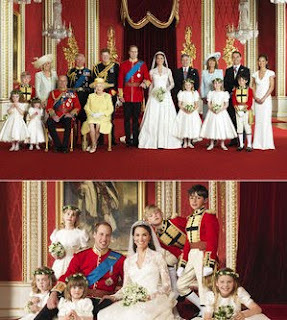 the marriage of William and Catherine is reminiscent of a time when tradition, duty, decorum and (gasp!) good taste was the rule, not the exception. Watching the coverage of the wedding one of the things I found most fascinating was genuine sense of pride that every British person on virtually every broadcast constantly referred to when talking about just how momentous an occasion the wedding was to them --- personally. Leading the charge was Piers Morgan who could barely contain himself any time he was explaining any aspect of the pageantry to his 'commoner' colleagues. After listening to the congregation sing 'God Save the Queen' Morgan proclaimed, with a noticeable catch in his voice, "And if that doesn't make you proud to be British, nothing will!" Clearly, no other country does pomp and circumstance like the Brits. History, and tradition mean everything to its citizens who have always been more collectively conversant about their history than a majority of Americans. But what makes the royal family -- particularly a twenty-something couple that hasn't been touched by scandal, isn't starring in a reality show and seems exceedingly level headed -- interesting to Americans? Could it be that we are actually hungering for the return of good taste? A shocking prospect, to say the least. Maybe it's because I want to believe it, but I think it's true. Designers interviewed about Catherine's wedding dress couldn't say enough about the tastefulness of the design. Vera Wang on CNN said it was the "perfect choice" for this "modern" bride. Yes, Catherine had chosen the avant guard house of Alexander McQueen, but Sarah Burton had not designed an edgy couture confection that the house is known for but rather a dress that was the absolute epitome of appropriateness modernized mainly by the woman who was wearing it. How much more of the moment could a design house hope to be than to dress the most famous woman on the planet? Aside from her role as instant style icon, Catherine has a far more substantial role to play in the future of the royal family. Instead of being the new Princess Diana, she must, in fact, be the anti-Diana in order to succeed -- and to ensure the future of the British monarchy. Where Diana was desperately unhappy plodding through the rainy grounds of Balmoral or sullenly watching from the sidelines while her prince played polo, Catherine is right at home in her wellies and gamely participates in shooting parties. Although she is allergic to horses (really! ), she is content to watch William indulge his passion for polo no matter how uncomfortable she may be -- always smiling for the caneras. While Diana bore the indelible scars from her unhappy childhood, Catherine has the obvious love and support of both still-married parents who have shown her just how valuable a happy marriage is to assuring the success of the family. The biggest difference between Catherine and Diana is in their marriages. Diana famously told Martin Bashir, "There were three of us in this marriage, so it was a bit crowded" when she gave that infamous interview that finally pushed the Queen demand Diana and Prince Charles divorce. Catherine has lived with and is now married to a man who loves her, who wanted to marry her and is determined to protect her. In fact, it is Diana's tragic life as a royal that has made Catherine's improbable one possible. After 30 years of scandal culminating in Diana's death, the monarchy was pulled from the precipice by Tony Blair (it's worth noting the former prime minister was not invited to the wedding) who anointed Diana 'The People's Princess' and somehow convinced the Queen that a television tribute to Diana and the subsequent show stopping funeral were necessary. But the damage had been done; the public's relationship with the royals has never been quite the same. Up until now, there has never been a thought given to any of its members ever being as remotely popular as the late Princess of Wales. Just months before William and Catherine's wedding, students attacked the car carrying Prince Charles and Camilla pelting it with rocks and food. In a stunningly symbolic gesture of hope for the future, that same car, repaired and shining like new, carried Catherine to Westminster Abbey on her wedding day. Now that the couple are finally wed, the whole world is watching as the new duke and duchess assume their roles as Britain's marquee players as the country enters into a new chapter in the longest running British soap opera. The country has been energized with revitalized national pride embodied by the first royal couple in decades that actually seem to have a fighting chance for a happy marriage. People want William and Catherine to succeed. I'm betting that as time goes on, all the royals will benefit from the reflected light of Catherine and William's stardom. As long as the couple appear to be happily married, scandal free and do just the right 'walkabouts,' they will have the Brits rooting for them and the royal family. Once their first child comes along and the marriage is still on course, there will be calls for William to become king rather than Charles. But that will not happen. There is a line of succession that must be followed. Tradition is all. William, ever the dutiful son, would never be a party to depriving his father of the role he has waited his whole life to assume. But he will have done his part is rescuing the future of the monarchy by picking the right bride. And just maybe while dutifully playing the roles the rest of the royal family is so intent on having them play, William and Catherine will wisely carve out their own path for the future of 'the firm' they will one day lead. Things look promising. They have chosen to live on a tiny island in Wales without servants and deferred taking their honeymoon so William can finish his RAF training. In marrying a 'commoner,' William has assumed the role Diana always wanted for him --a royal for the common man -- and assured the monarchy has a place in the modern age. God Save the (Future) Queen.